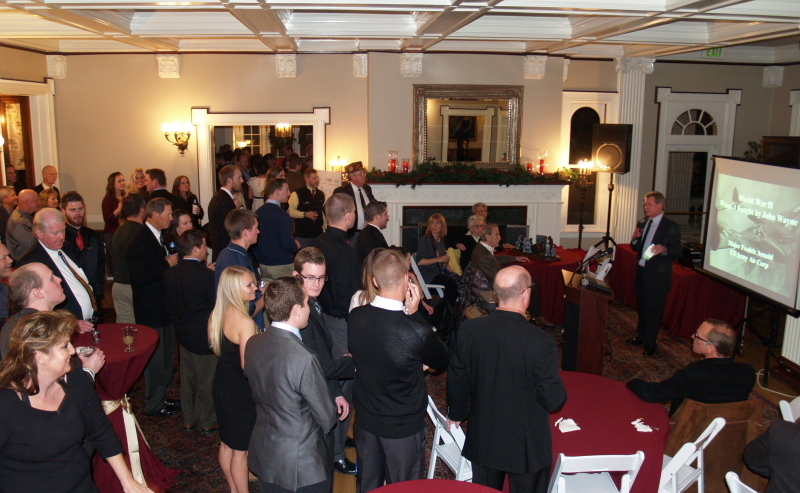 Our 3rd annual Holiday Party and Charity Drive continued the trend of being even more successful than the previous one! CABA again partnered with the Precision Flight Team of Metropolitan State University of Denver to promote and produce this event. Our Flight Attendants' Group placed drop-boxes at nearly 40 locations including FBOs, businesses, and campuses around the Denver metro area. Our Western Slope Regional Group also participated in a big way by placing bins and collecting donations in Montrose, Grand Junction, Delta, and Rifle. We were able to collect an amazing total of 2.5 TONS of toys and nonperishable foodstuffs! 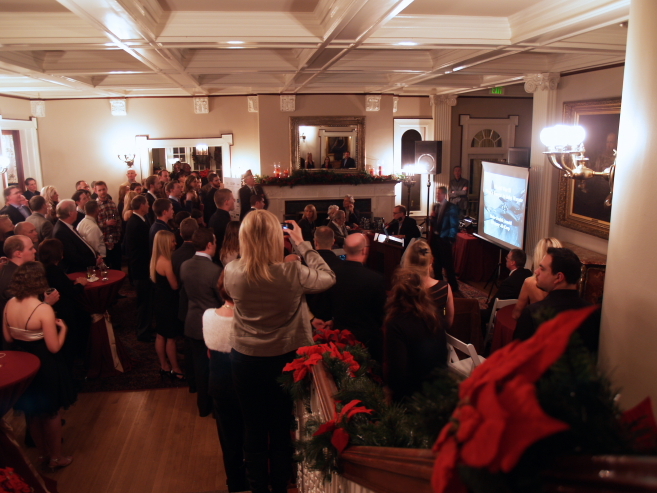 The Holiday Party was held at the Grant-Humphreys Mansion in central Denver. 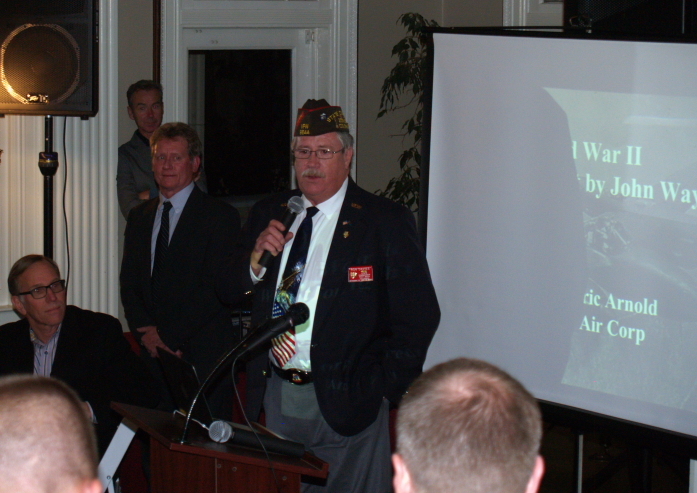 Members toured the historic mansion and were treated to complimentary beverages and hors d'oeuvres. 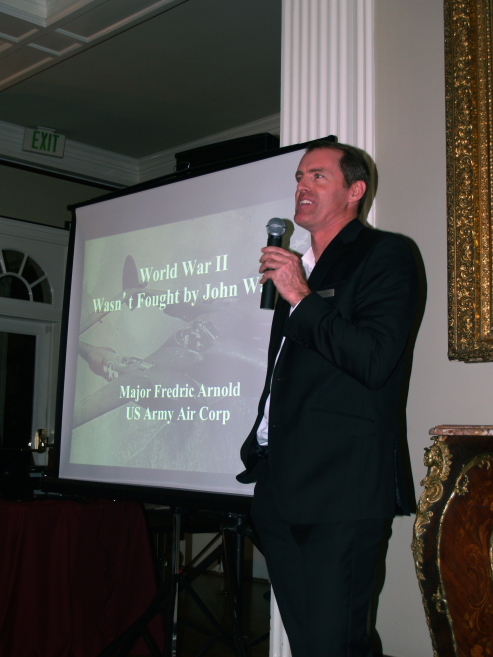 Major Fredric Arnold (Ret), a WWII P-38 Lightning pilot, artist, and author provided a very entertaining presentation that everybody enjoyed! CABA Board Chair Barry Stidham took a few moments to thank everyone for their donations. Tanya Gatlin, the Metro Flight Team Coach and Professor in the Aviation & Aerospace Department, told the crowd about the team and how well it was doing in national competitions. She also introduced the pilot-students who would be flying the donation flights. Vice Chair MacKenzie Kelly then presented Joe Guardiola with the CAE SimuFlite Lear Jet Type Rating Scholarship. Joe will fulfill his scholarship sometime during the spring of 2014. MacKenzie also presented the NBAA Leadership Conference Scholarship to Nicole McLeod, who will attend the conference in Atlanta in February. 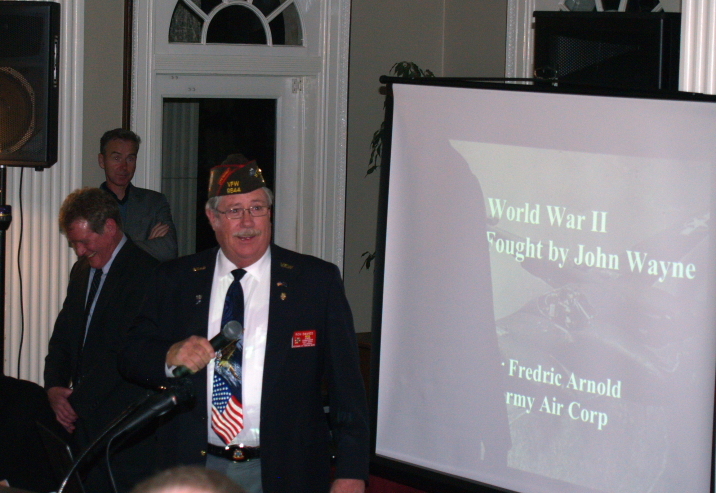 The VFW Holiday Airlift was scheduled two days after the party, however the weather forced a postponement until the following weekend. CABA members and members of the Metro Flight Team then donated their time, efforts, and aircraft to fly the goods to VFW representatives in Grand Junction/Montrose, Burlington, Trinidad, and Alamosa for distribution. A total of eleven aircraft were used to deliver the donated goods. We wish to give you ALL a heartfelt THANK YOU! so much for your time and efforts in donating the goods and helping us to make this possible!